View More In Table Benches. A household bench is something we all take for granted. It's the piece of furniture that just always seems to be there when you need it. But instead of tucking it away after it's used, why not have it be a quality piece of furniture that is beyond ordinary? A piece of furniture you want to have on display and accents your good taste? 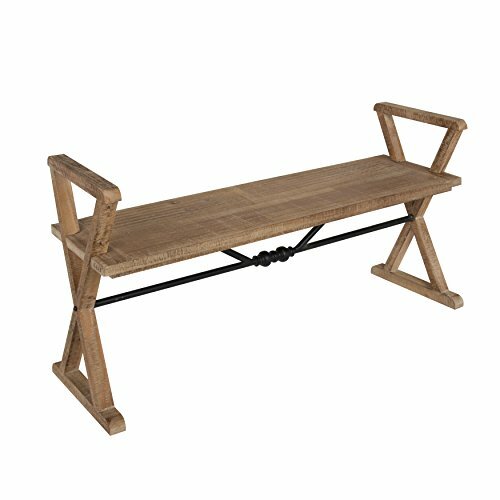 The Kate and Laurel Travere wood bench finished in a gorgeous rustic finish will be that piece for you. Hints of secret gardens and quieter times make the design of this bench a beautiful reminder that style doesn't have to be fussy to be fantastic. The dimensions are 4 feet long and almost 14 inches deep. The seat height is 18 inches from the floor.